Coney Island made the best of the hard root beers. I tried a few, and theirs was definitely the best. So, I figured I would try out their other wares. This one is a hard soda, so I hope it works out better than the Hard Cherry Cola that Best Damn sells. The beverage is not orange. I know you can probably see the golden color with (maybe) a slight orange tint, but I really feel the need to point out that this doesn't look like any other orange cream ale or orange cream soda or orange soda or hard orange soda or orange drink or whatever. The aroma is orange cream ale with... a very strong alcohol added. Maybe it's the scent I would expect from a moonshine that was orange flavored. Another beer from Nashville, and I'm starting to think that we have a LOT more small breweries than we have any right to have. I don't know why it took me so long to find local options, as there are just so damn many these days. 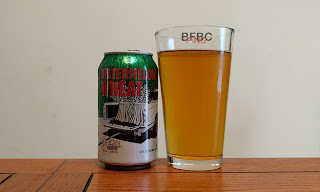 The last watermelon beer I remember having was bad. Fortunately, the only other one I had in this blog was really good, so this one has options. What head? This beer is too serious for some kind of head. I tried pouring dead center to get a bit of a head on it when I saw at first that it was going to have very little head, but it just wouldn't generate bubbles. I can see bubbles coming up from the depths of the golden beer, but they make the journey to die as soon as they hit fresh air. The aroma is actually faint watermelon, surprisingly, and yes I can smell wheat. I wouldn't have expected the watermelon to be strong enough to smell - and it is like those watermelon-flavored candies. This one might not go well, but I know that going in. I'm not a sour beer guy, but the fine folks at City Sliqours said this was a good one, and I trust them implicitly. So, I have a beer I think I can pronounce that I'm still going to look forward to having. Not only does the beer have a distinct red hue, but even the head has a red tint. The beer is so red that you might think it was just a red soda that had gotten tinted a bit too dark. 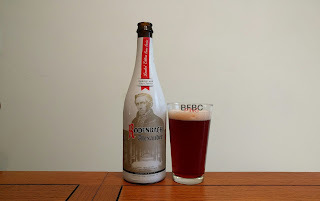 The aroma is very sour cherries, raspberries, and it is very acidic. As I'm not a huge fan of sour beers, this might be trying. The other Good People beer that I had was good enough, and I have high hopes for how good this one might be. The fact that this is a pale ale - I understand - means that this should be easier to make, as you just add more hops if you screw something up, and everything will even out in the end. If you add too many hops, just call it an IPA. The hazy gold beer has a crown of admirable stickiness that leaves lacing fit for a king. The aroma is excessively gentle. It's almost without smell, really; it's kind of spooky. This could be a glass of water that once flowed through a malt processing plant, and that's it. I'm guessing that this will be a very watery beer. First sip is more full of taste than expected. In fact, it has hops that are making themselves well known. Instead of watery, this beer is dry. The sip is confusing, though, with the hops and the malt in a big ball of dry. So, the Good People don't want me to sip their beer - and I can play their game. This is a local brewer, so I surely hope they bring some goodness. Nolensville seems an odd location for a brewer, as it's a small suburb of Nashville, but beer enthusiasts are where you find them, and I an willing to find people enthused with the idea of making beer wherever they happen to be. The haziness of this beverage becomes like a tornado of detritus in the center of the beer, and it's quite beautiful. The color is a nice yellow-gold with a white, sticky head that is in great clumps on top of the beer. The aroma is fruity and grainy. It's very nice, indeed. This is my second "Enjoy By" beer from Stone. These guys are probably second only to Lagunitas with the ability to put out a large number of beers in decent volume that are still fantastic. Even though I have reservations about the tangerine in the beer, I am looking forward to it. I fear that this will be like Magic Hat #9, which certainly wasn't bad, but it definitely was trying to cover something up with the addition of apricot. 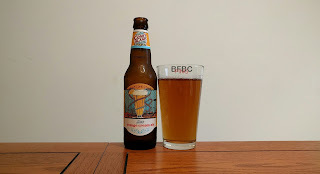 This is a golden-orange hued beer with a very nice, fluffy head that leaves lacing like it's a bride leaving her dress trailing after her down the isle. The aroma is surprisingly more grapefruit than tangerine, but I can smell the tangerine in there. I don't really smell distinct hops, so I suspect they are using citrus hops that are bringing out that grapefruit smell, and it's quite inviting. The last Straight to Ale had a devil and a giant 4 on it. This one has a screaming monkey in a space suit, so they have a string of interesting labels, I'll give them that. I opened one of these beers, and it was flat. I don't mean a little, either - it was completely without carbonation. Fortunately, that one was a fluke. I poured it out and grabbed the next one, and this one is fine. This sucker is kind of an amber-orange color with a nicely sticky white head that boils down to a thin layer across the top that covers it completely from side to side. The aroma is delightfully hoppy with pine and flowers that are scaled down with a fine malt in the form of fresh bread. The roll of Founders continues on unabated. They produce some great beers, and this one is an odd duck. I've never even heard of an "old ale" before, and I consequently have nothing to compare it to. So, I guess I'll have to break new ground in beer types today, and it's just my game. I'll go with calling this a deep, dark amber beer. The head dissipates quickly, but it leaves lacing on the sides well enough that I'll let it slide. I mean, it's not covering the sides or anything, but it's an artistic pattern that I find pleasing. The aroma is oak and molasses with what smells almost like mandarin oranges. First sip is very heavy and rich like an after dinner liquor with a fancy label and too much sugar used in its making. It's laden with oak and sweetness on top of a kind of crème brûlée. The sweet crackling top is there, but the milky cream isn't actually underneath. Instead, that oak runs deep. Hailing from Memphis, this is yet another brewer who is new to me. Do I just not get out enough? Am I not plugged into some "scene" that would let me sample beers from anywhere and everywhere? I mean, I'm one of Cammo Brewing's select customers, for crying out loud; I should get some preferential treatment. I'd go ahead and call this a hazy orange, but sticklers would point out that it has a bit more amber to it than that. The head is sticky as all get out, and it's impressively even on the sides (even though it's patchy on the top of the beer itself). The aroma is orange and maybe a little wheat. But I'm not here to smell the beer; let's have a sip. My third Black Abbey beer. The first was mediocre and the second was about the same (but only when not ice cold). This one is an APA, so I expect a solid, American taste and some brilliant hops. I hope the brewers don't read the previous reviews and think that I'm not pulling for them - I totally am! I want good beers wherever I am, and I'm in Nashville right now. 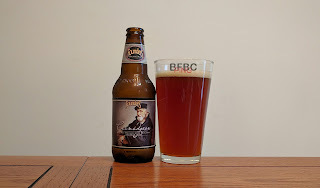 The beer is a lot more red and amber than I expected, and the bubbles sit patiently on the top of the beer, not wanting to cling to the sides too much for fear of offending. So, no lacing. The aroma is exceedingly faint, but I am getting malt and... I think I have some hops, but it's really not putting off much smell at all. If I hadn't read that this was an APA, I'd have guessed that this was an amber with its understated demeanor. The last Black Abbey beer was interesting, but ultimately disappointing. But, I won't let a mediocre beer set this brewery on a path of underwhelmingness. Instead, we soldier on with the next in the batch, and I have high hopes for the IPA. I rarely come across an IPA that I flat-out don't like, so I'm expecting good things here. 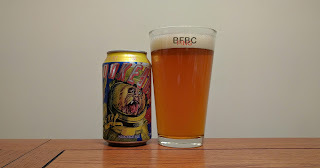 The beer is a deep, deep amber with a cream-colored head with teeny-tiny little bubbles that grip the sides of the glass with the tenacity of a dog with his favorite chew toy. Lacing is, consequently, very intense and almost artistic. The aroma is more malt than hops, which seems pretty odd. The hops are pine and fresh baked rolls. The journey into local beverages has had its ups and downs. I got a bunch of Black Abbey beers the last time I visited the best local beer place, so I'll be sifting through them within the next week or so. They are based in Nashville proper, according to their label, and that's all I have to go off of right now. It's a blonde, and it has some stiff local competition. It's a deep gold with a brown/orange hue added for artistic purposes. The head is minimal, and it goes away quickly to leave a scant ring around the glass and a few stragglers grouped into patches on top. The aroma is sweet and floral. It has something in it that smells almost apple, too, and it's quite inviting. I've already said that Founders is probably the most underappreciated brewer out there. They have been really good almost without exception. I didn't look too hard at this bottle before buying a six pack, as I have some faith that this beer will be pretty good - it has Founders written on the top, after all. I don't know what's going on with the label that has a tree that kind of looks like leopard print, and I don't want to try to figure it out. The brown beer has a heavy orange tint and a fuzzy light tan head that hits with lacing that grips the sides of the glass like an alien grabbing a space mine worker who went off by themselves after saying something like, "There's nothing down there. Here, I'll show you." The aroma is sweet malt with citrus hops hiding behind it like it just saw the alien just hissed loudly. Smells good.